It's March.... and here come Shamrocks! Today we had a blast making stain glass shamrocks. I changed it up from last month's crumbling tissue paper hearts. 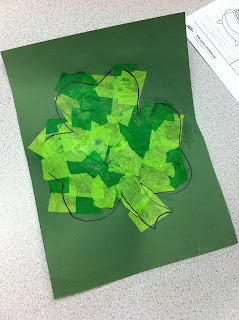 I traced a shamrock onto construction paper and had the kiddo's go crazy with clue and tissue paper! They had two shades of green, making each shamrock turn out different! After the tisssue paper was clued down, the mess began! They painted over their shamrock with White Elmer's Glue! This makes the tissue have a shiny affect once the glue dries. 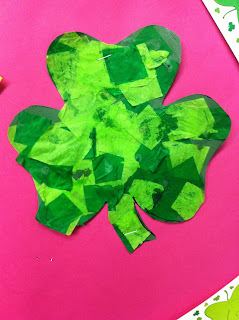 Once it was all dry, we cut the shamrocks out and put them up on our bulletin board! I love St. Patrick's Day!